Allet Krug Polman outlines how a high shear mixer is not only excellent in mixing and dispersing cohesive powder like pigment, toners and pharmaceuticals, but also can mix slurries very well. Hosokawa Micron BV's Cyclomix high shear mixer is conical shaped and has a central rotor which rotates at a speed up to 30m/s. The speed of the rotor creates centrifugal forces and pushes the product to the vessel wall. The conical shape of the vessel causes an upwards movement of the product. The cover part of the mixer guides the products towards the center of the mixer. Here it will be re-introduced to the bottom part of the mixing chamber where the mixing process starts again. The patented mixing mechanism of the Cyclomix ensures a homogenous end product and an ultra short batch time. As an example the Cyclomix can be used for intensive mixing of liquids like for example polymers, just water with fillers (powders), active ingredients or additives. 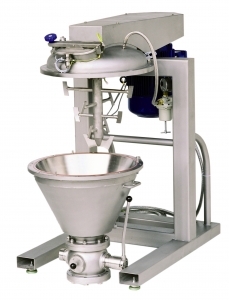 With the Cyclomix, it was possible to to optimise mixing lines for low viscous and high viscous slurries. The Cyclomix can for example be used for replacing central drive dissolver or eccentric pan mixers which are typical for these kind of applications. - Rather long mixing time of, for example, one hour for a batch of 1000 litres. - Inhomogeneous product quality after mixing. - Time consuming cleaning operation between batches and the necessity of operators entering the mixer vessel for cleaning. When the Cyclomix is used for intensive mixing of slurries, the powder/liquid ratio can vary from 20-80 per cent to 99-1 per cent. Especially the combination of viscous liquids and the addition of small amounts of powdery additives can cause great difficulties with the existing dissolver mixing systems. The mixing time can be long and the reproducibility between batches is mostly poor. As an example we can calculate with a process time in a 250 litre mixer of approximately 3 minutes. This process time is including a cleaning cycle after every batch, charging and discharging. The use of one single Cyclomix 250 litre results in a capacity of 5000 litre per hour. In this example the capacity of the Cyclomix was five times higher than a dissolver system. Due to the unique flow pattern in the Cyclomix the complete content of the mixer is in intensive motion, ie no dead spots can be found. Therefore no solids will be deposited in to dead zones in the vessel and a minimum of product will remain on the wall and cover. The result: a constant mixing quality and no disturbance by agglomerates which might be reintroduced in a certain stage of the mixing process. 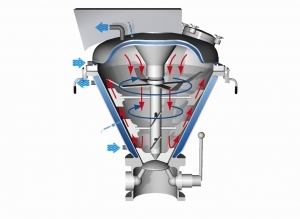 The conical shape of the mixer and the small gap between rotor and vessel ensures an easy and full discharge. Due to the sticky nature of products some homogeneous mixed product remains after discharging. In dissolver systems this layer at the vessel wall needs to be removed frequently and needs to be removed manually. This is a time consuming and difficult operation. Every time the dissolver needs to be dismantled, in some cases solvent connections need to be blocked and the system needs to be cleaned manually. In the Cyclomix process, mostly one of the liquid components of the recipes can be charged first to the mixer. The Cyclomix will run for about five seconds at a speed of 20-30 m/sec. During this cycle the Cyclomix is cleaning itself with the process liquid. After completion of this cycle, the mixer can be charged with the remaining liquids and solids after which they will be mixed. This procedure will remain after every cycle. By using the ability of the self-cleaning system of the Cyclomix, cleaning becomes an integral part of the process saving a lot of time and effort. An important goal of most of our customers is flexibility in serving their market, which results in many different recipes and various batch sizes. The Cyclomix is fully capable to fulfil these requirements. It can be used from 25 per cent up to 100 per cent filling rate resulting in a constant mixing quality.